Doris Cantrell remembers a story about Franklin. She wrote: Franklin was born in 1863, son of Alonzo H. Russell and as an adult he was a friend to the Indians. 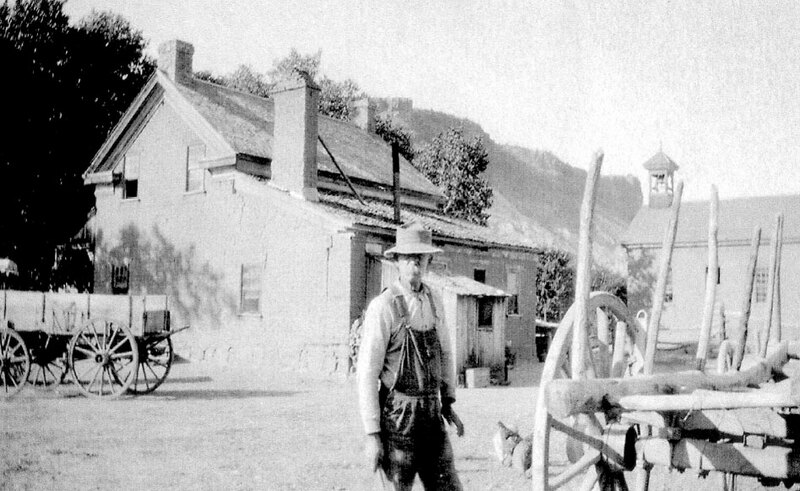 When the Indians came, he would go to his attic where he had flour stored for the winter and get a fifty pound sack. Then he would put it into the basket on the squaw’s back. The Grafton Heritage Partnership is looking for historic period wagons to put in Grafton to add to its historic character. Let us know if you have one you would like to donate. When the Grafton Heritage Partnership (Partnership) was founded fifteen years ago, our vision of preserving Grafton as an historic site was a dream. We have come a long way since then and with your help we have made a dream come true. In order to secure the future of Grafton, we ask that you donate to our newly created Grafton Endowment Fund and ask you to remember Grafton in your will. The purpose of the fund is to endow long-term operational and financial support for the Grafton Heritage Partnership Project. The intent of this endowment fund is to provide a permanent source of income to support the Grafton project, on a long-term basis. Please send in your donation today, or donate on line at www.graftonheritage.org. One of our goals of the Grafton project is to restore the Virgin River floodplain for wildlife habitat. The Partnership applied for many grants to remove Russian Olive trees and tamarisk from the floodplain and replant native willow on 175 acres of land. It took another year to raise all the funds we needed to start the project. The Natural Resources Conservation Service (NRCS) worked with us to successfully raise $225,000 for the project. Of the total amount raised $90,000 is from NRCS’s Working Lands for Wildlife Initiative; $24,000 came from the Fish and Wildlife Service Partners for Fish and Wildlife Program; $30,000 from the Utah Watershed Restoration Initiative; and $89,000 from the State of Utah Forestry Fire and State Funds. We want to thank all the organizations who came together to provide the funding for this project. The project will start in the fall and last for a couple of years. The Partnership ordered a replacement headstone for the grave of George Jethro Gibson whose headstone was broken in two. The replacement headstone will be a replica and made as similar as possible. New name plaques were ordered that will match the limestone headstones as the names on two Gibson headstones have worn away as well as four sandstone names plaques for the Indian graves will be added. Work will continue to repair the Loretta (Lotty) Russell age 14 and Elizabeth (Lizzie) Woodbury age 13 headstone that have broken off. 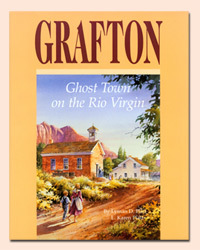 The books Grafton, Ghost Town of the Rio Virgin, by Lyman and Linda Platt which is an in-dept narrative of families who lived in Grafton and Historic Rockville, by Jane Whalen, which is a history of Rockville with a special collection of photos will be available for sale at the Grafton Reunion and on line www.graftonheritage.org. The Town of Springdale will hold the Butch Cassidy 10K Race on Saturday, November 2, 2013. The race follows a beautiful course through fall colors along the Virgin River from Springdale to Grafton. Part of the proceeds from this event benefits the Grafton Heritage Partnership. We want to thank the Town of Springdale and all the hundreds of volunteers who year after year make it all possible. More information and registration is at: http://www.springdaletown.com/events/butchcassidy- 10K-race/. The annual Grafton Reunion, will be held on September 28th, 2013 in the shade of the cottonwood trees at the Grafton town site from 12-2:00 PM. Bring your lunch, hat, chair and memories to share. The Grafton Heritage Partnership Project will have items available such as books, pictures of Grafton and t-shirts. There will be a program and if you have any stories you would like to tell about Grafton or a song to sing, let us know and we will put you on the program. (phone 435-635-2133) Everyone is welcome.